At least four people have been killed by a suspected bomb explosion in a Hezbollah stronghold in a Shia-dominated southern suburb of Beirut, Lebanon. Flames were seen pouring from the facade of a multi-storey building, with large plumes of smoke. Local media quoted officials as saying the blast was caused by a suicide bomber. There has been a spike in sectarian tension in Lebanon blamed on the conflict in neighboring Syria. Hezbollah forces have been fighting in support of President Bashar al-Assad in Syria, while Lebanese Sunni Muslims tend to back the Syrian opposition. The blast occurred in Arid Street in the Haret Hreik district. Large crowds gathered at the scene as Hezbollah’s emergency services worked to extinguish the blaze. Hezbollah sources quoted by the organization’s al-Manar TV said four people had been killed. Several more are reported to have been wounded. Body parts thought to be those of the suicide bomber were scattered at the scene, Lebanon’s national news agency reported. Caretaker PM Najib Mikati called a meeting of the government’s emergency response committee. It is the latest of several recent explosions in Lebanon. 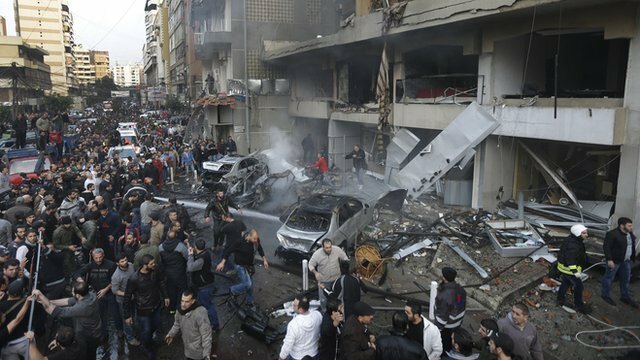 Five people were killed and many others injured by a bomb blast on January 2 in the same Beirut district. 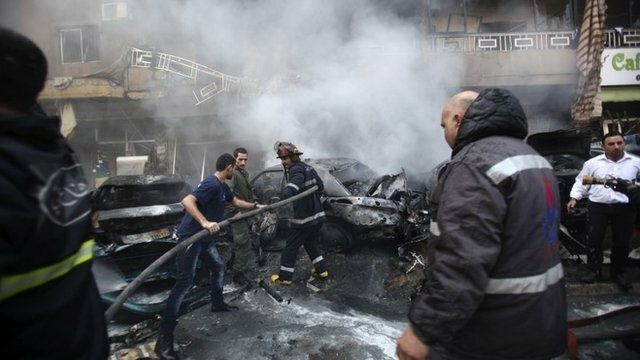 A car bomb hit a southern suburb of the Lebanese capital Beirut killing at least 5 people and injuring other 20, media and officials say. The suburb is a stronghold of the Shia militant group Hezbollah. Hezbollah’s al-Manar TV station said the blast destroyed part of a facade of a building in a densely populated area of Haret Hreik district. Beirut has been recently been hit by attacks linked to heightened Sunni-Shia tensions over the Syrian war. Former minister Mohamad Chatah, a Sunni and a critic of Hezbollah, was killed by a car bomb last Friday. Six other people died and at least 50 were injured. Former PM Saad Hariri, to whom Mohamad Chatah was an adviser, blamed Hezbollah for that attack but it has denied any involvement. No-one has yet said they carried out the attack, but it came a day after Majid al-Majid, the head of a Sunni jihadist group which claimed a suicide bomb attack on the Iranian embassy in Beirut in November, was reportedly arrested. Al-Manar TV showed large crowds gathered around twisted and burnt-out vehicles in front of a building that had been badly damaged in Thursday’s blast. Initial reports say the bomb was detonated in a four-wheel-drive vehicle. The street is home to shops, restaurants and residential buildings. The TV said the explosion took place a few hundred metres from the nearest Hezbollah political offices. Majid al-Majid, the Saudi “emir” of the al-Qaeda-linked Abdullah Azzam Brigades, had said that attacks would continue in Lebanon until Iranian and Hezbollah forces stopped fighting alongside government forces in Syria. Lebanon’s ex-Finance Minister Mohamad Chatah and four others have been killed in a huge explosion in central Beirut. Mohamad Chatah was an adviser to the former PM Saad Hariri, a Sunni Muslim. A car was seen in flames near government offices and the parliament. The Lebanese Shia militant movement Hezbollah has sent fighters to Syria to back the government of President Bashar al-Assad. Bashar al-Assad comes from the Alawite sect, a heterodox offshoot of Shia Islam. Some of the Syrian rebel groups are affiliated with the Sunni Muslim al-Qaeda network. Iran, which backs Hezbollah, saw its embassy in Beirut attacked last month. The Beirut blast damaged several buildings near the Phoenicia Hotel and set several cars ablaze. Dozens of people were reported injured. Mohamad Chatah became finance minister in 2008. After Saad Hariri lost the premiership in early 2011 Mohamad Chatah served as his senior adviser. Dozens of people have been injured after a car bomb exploded in a stronghold of Lebanon’s Shia militant group Hezbollah in Beirut. A Red Cross official said 37 people had been hurt in the blast, in the Beir el-Abed area. TV pictures showed vehicles on fire and a cloud of black smoke. No group has said it was behind the attack. Rebels in neighboring Syria have threatened to target Hezbollah, which intervened in the fighting there to support President Bashar al-Assad. 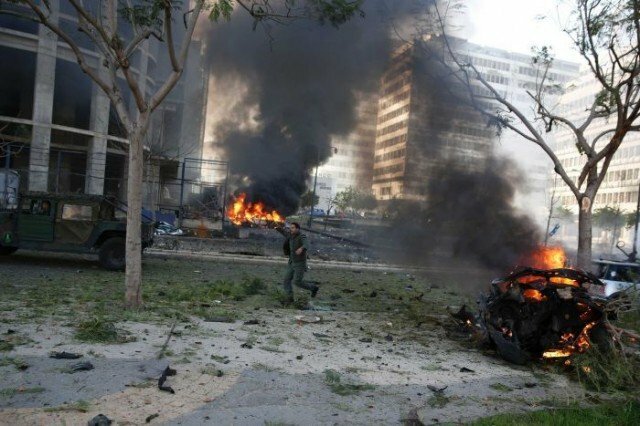 Two rockets hit south Beirut in May. The explosion was caused by a car bomb in the car park of an Islamic centre, Hezbollah-run al-Manar TV said. Dramatic footage broadcast by the station showed firefighters trying to put out the flames. “This is a message, but we will not bow,” Hezbollah official Ziad Waked told al-Manar, AP reports. Hezbollah fighters were instrumental in Syrian government forces’ strategic victory in Qusair in early June. Clashes have erupted outside Lebanese government offices in Beirut after thousands attended the funeral of security chief Wissam al-Hassan who was killed by a car bomb on Friday. A group of protesters tried to storm the HQ, after a new call for Prime Minister Najib Mikat to resign. Police fired warning shots and tear gas. Friday’s attack also killed one of Wissam Hassan’s bodyguards and a woman nearby. Opposition figures have blamed neighboring Syria for the attack. Many have protested against Syria and its Lebanese allies amid fears the Syrian conflict could spill over. The confrontation outside the prime minister’s office lasted for a few minutes. Two former prime ministers – Saad Hariri and Fouad Siniora – intervened to urge their supporters to remain calm. Lebanon’s religious communities are divided between those who support the Syrian government – including many Shias – and those mostly from the Sunni community who back the rebels. Syrian troops withdrew from Lebanon in 2005 after a 29-year-long presence, in the wake of the assassination of former Prime Minister Rafik Hariri. Wissam Hassan, 47, was close to the 14 March opposition and the Hariri family, part of the anti-Syrian opposition. President Michel Suleiman and Prime Minister Najib Mikati – who has faced calls for his resignation over the killing – greeted Wissam Hassan’s coffin at an earlier ceremony at the headquarters of the Internal Security Forces (ISF). Wissam Hassan headed up the intelligence branch of the ISF. The car bomb exploded close to its offices in the east Beirut neighborhood of Ashrafiya. He was to be buried alongside former Prime Minister Rafik Hariri. Wissam Hassan led an investigation into Rafik Hariri’s assassination, which implicated Damascus. A day after the bombing, Prime Minister Najib Mikati suggested the attack had been connected with that case. Many mourners at Sunday’s funeral waved the light blue flag of the Sunni-based opposition Future Party, while others carried Lebanon’s national flag. Many people described Wissam Hassan as a martyr who was killed trying to protect his country. “We came for Lebanon’s future to show that we will not be scared,” said one of the mourners. The prime minister offered to stand down as prime minister on Saturday, but President Michel Suleiman asked him to stay on in the national interest. A prominent Lebanese opposition MP, Ahmad Fatfat, said the conflict could escalate into civil war. “What Mr. Assad is trying to do now is transfer his problem to all the countries around Syria – to Turkey, to Lebanon, to Iraq, to Jordan, and Lebanon is the most fragile in this story,” he said. Arab League Secretary General Nabil al-Arabi said he hoped the situation in Lebanon would be settled, with calm returning. “It’s very delicate what’s going on and I hope the Lebanese, as usual, will be able to get through this difficult time,” Nabil al-Arabi said. A car bomb blast has killed at least two people in the centre of Beirut, Lebanese security sources say. About 15 people are also reported to have been wounded in the explosion in Sassine Square, a busy part of Beirut’s eastern Ashrafiya district. Ambulances have been seen rushing to the square. Witnesses say the blast was heard several kilometres away. The intended target is unclear. Tensions in Lebanon have been rising as a result of the conflict in Syria. 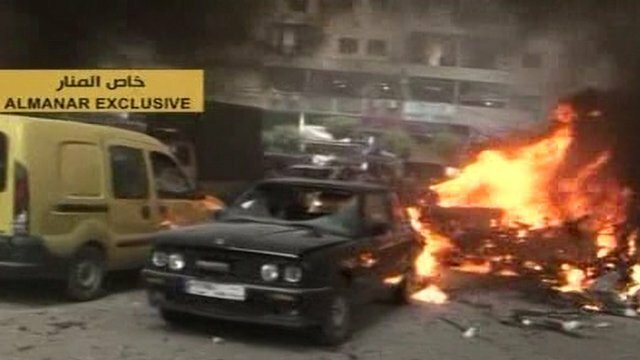 Friday’s attack is the first major car bomb attack in Beirut for four years. It occurred near the headquarters of the Kataeb, better known as the Phalange, a Maronite Christian group. Ashrafiya is a predominantly Christian district. Several cars were set on fire as a result of the blast. TV footage showed considerable damage to of buildings. A nearby hospital is calling for people to donate blood to help treat the wounded. 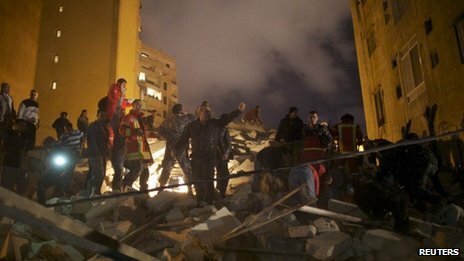 At least 13 people died and 12 have been injured after a five-floor block collapsed in the Ashrafiyeh district of the Lebanese capital Beirut on Sunday evening. Rescue workers in Beirut continue to search for survivors in the rubble of a collapsed building. “We are hoping to find people alive. There are still some missing,” Health Minister Ali Hassan Khalil told Lebanese television. It is not known yet what caused the sudden collapse. Local reports are speculating that cracks in the building made worse by heavy rain may have been the cause or that the building could have been damaged by the impact of construction at several nearby sites. Local television said seven of the dead were foreign laborers, including two from Jordan. “It was like an earthquake” when the block collapsed, one witness told a local television channel. One resident who escaped with her mother said the building was extremely run-down and the owner had recently warned tenants to move out, the AFP news agency reported. Lebanese President Michel Sleiman visited the site on Sunday evening as did Interior Minister Marwan Charbel. Minister Marwan Charbel told reporters the building’s owner was being questioned by the authorities. He added it was essential to carry out a survey of similar buildings across the country, many of which were built illegally or had several floors added without proper permits.